Senate Majority Leader Harry Reid (D., Nev.) took to the Senate floor on two separate occasions Wednesday to attack libertarian philanthropy barons Charles and David Koch. During his initial outburst, Reid complained that every single "horror story" about Obamacare, specifically those mentioned in ads financed by the Koch-affiliated Americans for Prosperity (AFP), were "untrue." The Koch brothers, he said, had "no conscience." It’s all part of a larger, coordinated effort to make the 2014 midterms a referendum not on President Obama's policies, but on the political activity of two private citizens. Senator Kay Hagan (D., N.C.), for example, has based her entire campaign around this trope. When Reid returned for round two, he appeared to walk back his original claim, saying that, well, maybe not all of AFP’s anti-Obamacare ads are "lies," but merely "the vast majority" of them. The walk-back ended there. Armed with an anti-Koch op-ed written by Democratic pollster Mark Mellman, the majority leader slammed the "immoral and dishonest" Koch brothers for trying to "buy our democracy." In fact, Reid said, the Kochs are "about as un-American as anyone that I can imagine." 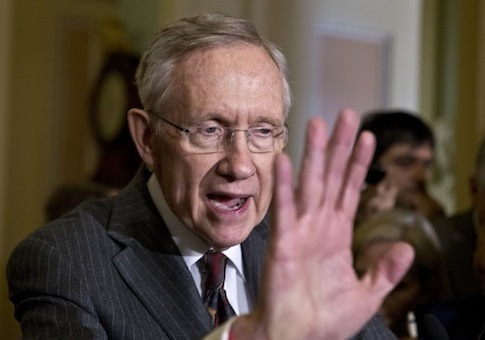 Reid has a history of volatile behavior, and is no stranger to outright dishonesty. In 2012, he famously peddled baseless speculation about Mitt Romney’s taxes, and, more recently, Reid spread false allegations about Representative Pete Sessions (R., Texas). And for all his concern about money in politics, Reid is perfectly happy to attend a fundraiser hosted by Tom Steyer, the left-wing billionaire and reluctant democracy advocate who has pledged to spend at least $100 million in support of Democrats, and who thinks David Koch will go down in history as a "famously evil person." Nor did Reid complain in 2012 when a handful of wealthy liberals poured money into a Super PAC that ran ads implying that Mitt Romney was responsible for a woman’s death from cancer. Sure, Reid could be more consistent in attacking the morality of wealthy individuals trying to influence the political process. But to quote the majority leader explaining his opposition to helping children with cancer: "Why would we want to do that?" This entry was posted in Politics and tagged Harry Reid, Koch Brothers, Obamacare. Bookmark the permalink.